The Arsenio Rodriguez Project presents Las Estrellas De Arsenio at the world reknown San Francisco club Yoshi’s (8PM and 10PM) this Saturday, September 28, 2013 and then travel south to The Granada (Alhambra) in Los Angeles for a special presentation on Sunday the 29th. Las Estrellas De Arsenio were formed in 2011 as an all-star ensemble from New York, Los Angeles & San Francisco designed to pay tribute by presenting the original arrangements of the man many credit with being one of our industries greatest innovators, on his 100th anniversary, Arsenio Rodriguez. 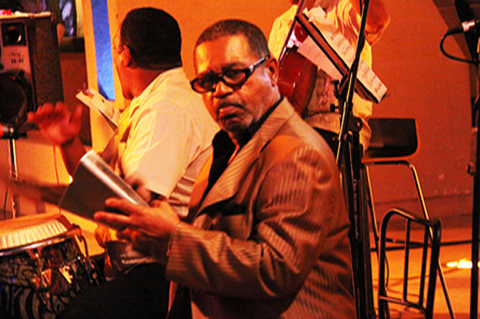 The all-stars were formed with the great Alfredo ‘Chocolate’ Armenteros who was part of the Arsenio Rodriguez conjunto back in Cuba in his early years. The New York element of the band still includes two giants in Jose Mangual Jr.on Bongo and Nelson Gonzalez on tres. Arsenio Rodriguez, ‘El Ciego Maravilloso’, has been recognized by many as creator of the ‘Mambo’ through his conjunto format that first introduced the conga drum considered a taboo at the time because of its African roots and Arsenio’s heavy roots as a descendent of Congolese slaves. Amongst his many credits the two major imprints Arsenio has had were his bringing the African roots to Cuban soil and his endless compositions that have made a huge impact on ‘Salsa’ music since the 1960’s. As a tresista Arsenio has been an inspiration to many guitar players but none more than Nelson Gonzalez. Nelson Gonzalez, born in Vega Baja, Puerto Rico, has been recognized by those in the know as the closet to emulate the original sound of Arsenio Rodriguez on tres, the instrument that is the most essential in the interpretation of the ‘Cuban Son’, and the reason why Grammy award winning artists like Cachao, Ruben Blades, Bebo Valdes, Tito Puente/Eddie Palmieri and Gloria Estefan have enlisted Nelson’s immense talent to their CD’s. “Cachao asked me to be part of his recordings because of my similarity to the original sound that Arsenio played and even named me The Embassador of The Tres”, Nelson explains after a performance in New York, “When Rene Lopez had me listen to Arsenio’s songs on a cassette he gave me I was mesmerized by Arsenios’ tres and practiced, delved into the history of Cuban music until I had it down packed”. 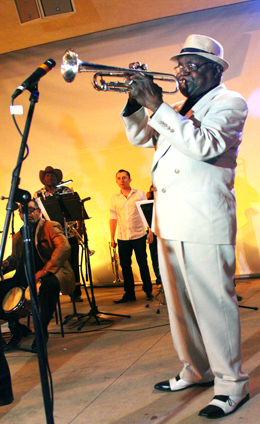 Nelson has graced many recordings after his debut with Cuban Justo Betancourt in 1971 and then during a brief stint with Orchestra Harlow left with Harlow vocalist Ismael Miranda to form Orquesta Revolucion. Amongst those recordings you can hear Nelson with the legendary Grupo Folklorico Experimental Nuevayorquino, of which he was a co-founder, that was comprised of musicians that met regularly at the home of the brothers Andy & Jerry Gonzalez, in the Bronx. He was also with the great Tipica 73 for four years before moving on to Los Kimbos de Adalberto Santiago. In 1976 he records his first solo LP for Tito Rodriguez’ label TR Records. I first met Nelson back in 1984 when he recorded “Feliz y Conteto” with his band Orquesta Revelacion, when he had a young unknown vocalist Alex D’Castro, on the Bernis label on Tremont Avenue in the Bronx (just three blocks from my mother’s house). “It is important that people understand that the music we play as Las Estrellas De Arsenio is the original arrangements as Arsenio himself played them” Nelson proudly announces to all those willing to learn. “Grupo Folklorico Experimental Nuevayorquino banded once again to record about a year ago in a recording ‘Homenage a Arsenio Rodriguez’ with many former Arsenio Rodriguez band mates like Chocolate, Alfredito Valdes Jr, Armandito Armenteros and others that we are still searching for someone to release it”, was the surprise revelation that Nelson mentioned to me by phone, “and I myself have four unreleased recordings of which one is “Rumba Con Tres” with Los Muñequitos De Matanzas. Jose Mangual Jr., son of the legendary pioneer bongo player Jose ‘Buyu’ Mangual from one of The Palladiums best big bands ever, Machito and his AfroCubans, grew up to become a top percussionist, vocalist, arranger, songwriter, and bandleader from Spanish Harlem. At 15, in 1968, Jose was already a part of another historic band, the Willie Colon Orchestra with vocalist Hector Lavoe, where he became an intricate part of that famous band and the chorus section (that included Willie and the great Milton Cardona). Who knew back then the impact the Colon band would have in the world and the new generation of Salseros still developing today. His first recorded compostion, co-written by Kent Gomez, was for Tony Pabon y La Protesta titled “San Miguel”, in which he also debuted as a lead vocalist. In 1977 he formed his own label, True Ventures Inc., where he debuted with the classic “Tribute to Chano Pozo” and the hits “Campanero” (that features the innovative cowbell solo by Jose) and “Cuero Na’Ma”. It was also Jose’s move to become a lead vocalist that blew me away as a fan. From there he continued to produce but this time as an artist for the Venezuelan label Velvet. His credits as a musician, musical director and arranger reads like a ‘Who’s Who’ for names like Ruben Blades, Juan Luis Guerra, Dizzy Gillespie, Celia Cruz, Mongo Santamaria, The Fania All-Stars, Ismael Miranda, and many more. 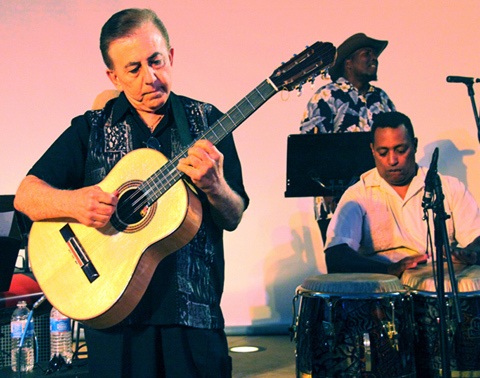 After The long awaited 1995 release of “Tribute To Chano Pozo II” came a new phase for Jose Mangual Jr. with the Caiman label formation of the award winning band Son Boricua, with co-leader vocalist Jimmy Sabater. With the CD’s “Son Boricua” (1998), “Musical a Cortijo y Rivera” (2000), “MO” (2002), “Clasicos 60’s”, and “Fabulosos 70’s” had become a showcase for Jose as a vocalist (along with Sabater), a composer and musical director for his own projects. Until the release of “Dancing With The Gods” in 2003 my best recording by Jose had been the 1981 “Que Lo Diga El Tiempo” on his Campanero label. “Dancing With the Gods” combines his Santero roots to some of the best swing music ever and continues to show us his constant growth as a full musician. Jose was fortunate enough to hear Arsenio play with his conjunto at the local clubs and bars were Arsenio delighted the crowds throughout the five boroughs of New York. “As a young man I remember leaving a club only to see at the bar next door, La Campana, an advertisement that Arsenio was performing there that same evening so I went in and was blown away by the performance”, Jose recalls as if it was yesterday, “I was there to see his percussionist and was able to witness Arsenio’s genius. Everyone who knew him knew what he had done for the music but over the years he has been forgotten by some and our aim here is to show fans of music today the authentic ‘Cuban Son’ as Arsenio played it”. I was also fortunate to be at the Arsenio Rodriguez recording with “El Elemento Del Bronx” of which my father played on. When musicians would all play together to feed off of each other… the way great recordings were done.” That recording was the Bang recording “Viva Arsenio” with his Afro-Cubano Sound in 1966. Fans of Cuban Son, the Buenavista Social Club or Arsenio Rodiguez need to experience Las Estrellas De Arsenio to live today what this unique legend was like in the 40’s & 50’s and witness the history of yesteryear today. It is not every day you get to see this so head out to Yoshi’s this Saturday in the Bay area and The Granada in Alhambra to see these great musicians honor the name of Arsenio Rodriguez. Nelson Rodriguez - Former GM & Director of Promotions for TH Records and later National Director of Promotion for RMM Records & Videos has been a radio host at Alma Del Barrio-KXLU in Los Angeles and spent 21 years as a writer for Latin Beat Magazine. He is currently writing for Herencia Latina.com.